The public school band told Q magazine they don't suffer the same abuse over their privileged roots in the US as they do in the UK. Banjo player Winston Marshall said: "Class is a big issue here. And some people get picked on more than others. I think we probably do. I mean, it doesn't help that we wear waistcoats and tweed the whole time. "But there is a reverse snobbishness in England towards that sort of stuff. And I think that's one of the reasons we really enjoy America, 'cos we're classless." 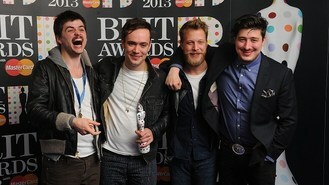 Ben Lovett appealed for the UK public to give the band a break, saying: "I think it's unfair to hammer anyone for anything. People should celebrate or ignore, that would be nice. On top of that, I just don't consider myself a posh person." Bassist Ted Dwane added: "We're not the first band who went to public school." Mumford And Sons have been heavily promoted by Eton-educated David Cameron in the past, who recommended them to US President Barack Obama for a White House performance and joked he should get a cut of their future earnings for bumping up their international profile. Posh isn't the only label the band hate - frontman Marcus Mumford, whose parents are prominent Christian leaders and who met actress wife Carey Mulligan at a Christian youth camp, doesn't like being pigeon-holed as religious, either. He said: "Yeah, it p***** me off. Just being thought of as a Christian is annoying. Not that there's anything wrong with it. It's just being told you're anything when you're not."